Walking down Shazar Boulevard at the entrance to Jerusalem, one can easily recognize the massive building of Binyanei Haooma. But if you look further down the road, you will notice a path leading to a smaller building. Looking at the signpost you will read "The Central Zionist Archives" (known as the CZA). "We've walked past this building hundreds of times but never noticed it before," remark some first-time visitors. While visiting the CZA in 1996, former Israeli President, Ezer Weizmann, exclaimed in his very special style: "Listen, this is absolutely the treasure vault of the Jewish people". Indeed, it is a unique place. Built in 1987 to store the rapidly growing collections of the Zionist movement, the building's apparent size is deceptive: in addition to the two floors visible from the outside, there are 4 more floors underground, containing vast store-rooms, specially designed to protect the collections from the vagaries of time. The Zionist Congresses determined that the Archives would collect all documentation of historical value regarding Zionism in all its forms and in all periods and countries, as well as the papers of persons and unofficial bodies. As stated by The Zionist Congresses "In this way they would be commemorated in the heart of future generations". 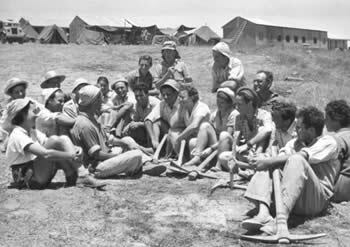 Over the years the Archives collected and preserved the material created by the various offices of the World Zionist Organization, the Jewish Agency, the Jewish National Fund, Keren Hayesod and other bodies related to the history of the Land of Israel and the Jewish people. The Archives' efforts during the years have yielded an impressive collection: well over 80 million documents or "10 kilometers of Zionism" are kept at the Archives. The material includes the archives of the "Founding Fathers" of Zionism, in particular, of course, that of Herzl, as well as 1,300 personal archives of others who contributed to Zionism and the up building of the Land of Israel in various fields such as journalism, economics, medicine, education, industry and so forth. 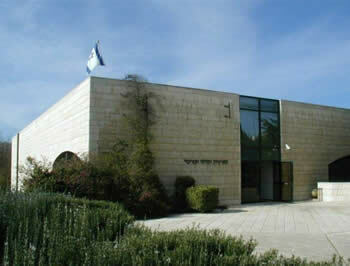 The Archives holds the material of various Zionist Federations around the world, including the material of the Federations in England, Italy and more. One can spend days indulging in some of the collections. The Photograph Collection comprises more than half a million photos and negatives portraying the great moments of Jewish history in the last 100 years as well as daily life in Eretz Israel and the Diaspora. Another unique source is our Poster and Ephemera Collection. Comprising tens of thousands of items, these collections are used daily by producers, curators, website designers and others. The CZA also houses a very important Map Collection, mainly containing land acquisition and settlement plans. These collections are being scanned and are constantly in use. A vast Newspaper Collection reflects aspects of the Zionist polemic in Palestine and in the Zionist Movement at large. Last but not least, the Archives holds Jewish National Fund stamp collections, which show the institutions, settlements and the great leaders of Zionism in a special way. "I am writing to you from England in order to check whether you have any information on my uncle who immigrated to Palestine from Rumania in the 1930's, to live in Tel Aviv…". Almost every day requests of this sort are received at the Archives. In the last decade we are witness to a growing interest in family research. Books, websites conferences – everyone, it would seem, are searching for resources that will assist in the building of the family tree. Large amounts of important genealogical material, especially pertaining to the British Mandate period in Palestine, can be found at the Archives. A few examples: the material of the Immigration Department of the Jewish Agency contains hundreds of thousands of general and personal files, card catalogues and name lists of immigrants. One can also find the files of Youth Aliyah, partial lists of illegal immigrant ships, lists of detainees in Cyprus, etc. Since the Jewish Agency was in charge of enlistment to the British Army during World War II, the Archives holds important material on this interesting chapter of Jewish history, including enlistment and discharging lists. Also kept in the Archives are population censuses and voter lists: of particular note is the 1939 Jerusalem census, which enables one to locate residents of Jerusalem on the eve of World War II. 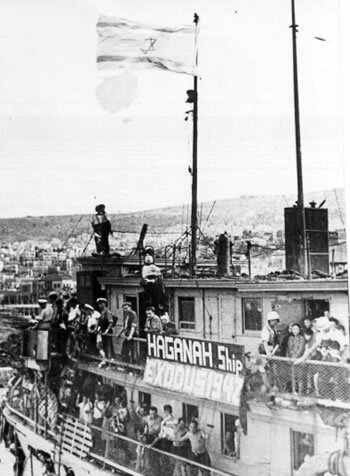 The ship Exodus, 1947, carrying Jewish Holocaust survivors. 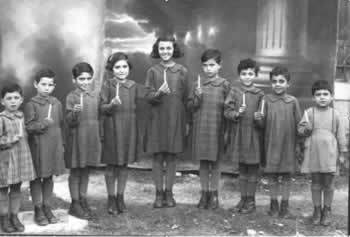 The ship left France on July 1947 with the intent of taking its passengers to Palestine, was seized by the Brtiish navy, and all passengers were deported back to Europe. These and other data sources have made the CZA one of the most important locations for family research. In light of the rising interest in this field, the Archives set up a special Department of Family Research. If you are interested in genealogical information, please check our websites for additional information. For those who want to see "the best of the Zionist Archives", you are invited to visit them. The Archives holds guided tours for groups in English. 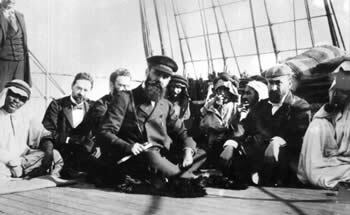 While visiting you will tour the building, see an early film produced in Palestine, and visit Herzl's archives.